This week our Etsy shop is Vegancraftastic, brought to us by Kala. Embracing her love of all things crafty, Kala's shop offers a variety of things that she has sewn, knitted, crocheted, beaded, etc. If you purchase an item from Vegancraftastic you can rest assured it is handmade and 100% vegan. Let's see these great vegan finds! Don't these cuties go perfect with the Joy de Vivre Halloween theme this week! The babies come in a set of three and are made of acrylic yarn. They are 3 1/4" X 4 1/2" at their widest points. Get them now for half off during the Halloween sale! This 8" bracelet is made from brilliant blue and red glass beads and a metal toggle closure. Kala has a lovely story to this bracelet. 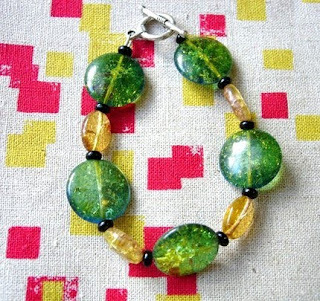 She made the Duluth Bracelet from green, yellow and black glass beads that she bought in a Duluth , Minnesota shop while on her honeymoon. Perhaps you can purchase the Duluth Bracelet and create some beautiful memories as well while wearing it! My love for cupcakes has been documented many, many times here and I think this pouch is perfect for my fellow cupcake junkies! There is nothing more perfectly sweet than a cupcake! The pouch measures 7 1/4" X 5 1/2". This week for our giveaway Kala wants our winner to do the shopping! Why should we have all the fun of picking out items for you all every week? This week our winner, who will be chosen Friday, will be able to pick one item to receive from Vegancraftastic. Enter by adding a comment about one of the items in Vegancraftastic. Second entry to anyone who is a follower of Joy de Vivre. Thank you for sharing another shop! I absolutely LOVE variety shops (hence why I am one... :) ) and Kala has some gorgeous things that look amazing and probably make you feel amazing just having them! I just love those little Candy Corn Babies! Everything is so much better with a cute face on it. Thanks so much for featuring my shop, good luck to everyone entering! The candy corn babies are so cute ! ok, I don't usually go for the cutesy stuff, but I have to say, "Those candy corn babies are sooooo cuuuttte!" so cute! ( i just added to follow) the candy corn babies are so cute but i fell in love with the halloween and retro kitty project bags and the vintage halloween zip bag. I laughed hard at the i heart tofu markers!! okay, so the candy corn babies are cute, but really, i've been lusting after the pirate scissors project bag FOREVER. seriously, every day, i wonder why i don't have that bag to stash my newest mitten/sock project in as i tote it haphazardly around town in my purse. I really love the stitch markers Purple Amber Stitch Markers. I love the colors, and what's better than exciting stitch markers for your knitting? Congrats to Kala for the feature! I love the skull pincushions! I've had my eye on those robot pins for quite awhile now! The Nesting pattern is great. I love the drawstring bags with the fall themes, especially the crows and pumpkins one. 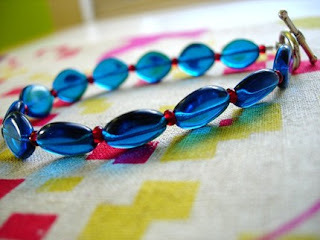 Lovely - I can hardly take my eyes of those blue beads! 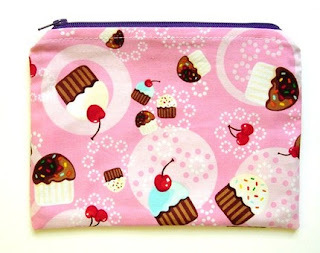 I love the Cupcake Queen Zippered Pouch. It is so cute ^^ And the Robot 1 inch Pin Set - Set of Four is adorable too. Oh, I love the skull and scissors and also the kitty project bags! So cute. Lots of great items, but the candy corn babies are my favorite! The candy corn babies are adorable, but I totally love the skull pins, too! I really like the black and orange Leaf stitch markers! The cupcake zippered bag is so cute! Thanks for the contest! i love the sheep friends drawstring project bag! thanks for the giveaway! The geek in me absolutely loves these Robot Magnets! Hmm - love the cupcake bag, but the skull and scissors project bag take the cake! What interesting fabric - Spoonflower? I absolutely Love <3 <3 the Skulls N Scissors Drawstring Project Bag !! I have been watching this Polka Dot Girl Zippered Pouch - Clutch for quite some time... A giveaway would be GREAT! I love the kitties and yarn bag! But since I have lots of bags, if I were choosing something for myself, I'd choose one of your fun stitch markers. I'd get the Sookie stitch markers for a friend, but sadly she doesn't know how to knit! Oh you KNOW I'm all about the cupcakes!! 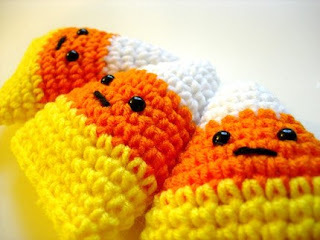 And I just had to say that I'm not a candy corn fan, but those little guys are so cute. I never got to tell you I got my earrings a little while ago, but thanks so much for them! My favorite is the Citrus Blues stitchmarkers! Great shop! I think my favorite is the Sheep Friends Drawstring Project Bag. oohh, I love the candy corn babies, but I must say I love the bracelets mostest. they are simply beautiful. and the candy corns are adorable too! I love the candy corns! They are adorable! Love the candy corn babies and that skull and scissors project bag! A-freakin-dorable! Such cute stuff! I'm in love with the skull and scissors patterned project bag. I've never seen that pattern!